A child restraint system for a small child or baby must itself be properly restrained on the seat with the latch anchors or the lap portion of the lap/shoulder belt. The laws of all 50 states of the U.S.A. And canada now require the use of child restraint systems. Studies have shown that installing a child restraint on a rear seat is much safer than installing one on the front passenger seat. Choose a child restraint system that suits your vehicle and is appropriate to the age and size of the child. For installation details, follow the instructions provided with the child restraint system. General installation instructions are provided in this manual. use a child restraint system appropriate for the child until the child becomes large enough to properly wear the vehicle's seat belt. If the child is too large for a child restraint system, sit the child on a rear seat and use the vehicle's seat belt. for effective protection in automobile accidents and sudden stops, a child must be properly restrained, using a seat belt or child restraint system depending on the age and size of the child. Holding a child in your arms is not a substitute for a child restraint system. In an accident, the child can be crushed against the windshield, or between you and the vehicle's interior. Toyota strongly urges the use of a proper child restraint system that conforms to the size of the child, installed on the rear seat. According to accident statistics, the child is safer when properly restrained in the rear seat than in the front seat. Never install a rear-facing child restraint system on the front passenger seat even if the "air bag off" indicator light is illuminated. In the event of an accident, the force of the rapid inflation of the front passenger airbag can cause death or serious injury to the child if the rear-facing child restraint system is installed on the front passenger seat. A forward-facing child restraint system may be installed on the front passenger seat only when it is unavoidable. A child restraint system that requires a top tether strap should not be used in the front passenger seat since there is no top tether strap anchor for the front passenger seat. Adjust the seatback as upright as possible and always move the seat as far back as possible even if the "air bag off" indicator light is illuminated, because the front passenger airbag could inflate with considerable speed and force. Otherwise, the child may be killed or seriously injured. Do not use the seat belt extender when installing a child restraint system on the front or rear passenger seat. If installing a child restraint system with the seat belt extender connected to the seat belt, the seat belt will not securely hold the child restraint system, which could cause death or serious injury to the child or other passengers in the event of an accident. 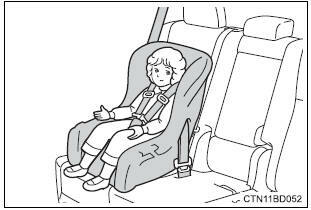 do not allow the child to lean his/her head or any part of his/her body against the door or the area of the seat, front and rear pillars or roof side rails from which the srs side airbags or srs curtain shield airbags deploy even if the child is seated in the child restraint system. It is dangerous if the srs side airbags and curtain shield airbags inflate, and the impact could cause death or serious injury to the child. Make sure you have complied with all installation instructions provided by the child restraint manufacturer and that the system is properly secured. 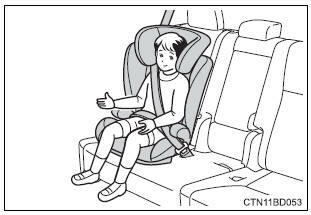 If it is not secured properly, it may cause death or serious injury to the child in the event of a sudden stop or accident. Do not allow children to play with the seat belt. If the seat belt becomes twisted around a child's neck, it may lead to choking or other serious injuries that could result in death. keep the child restraint system properly secured on the seat even if it is not in use. Do not store the child restraint system unsecured in the passenger compartment. If it is necessary to detach the child restraint system, remove it from the vehicle or store it securely in the luggage compartment. 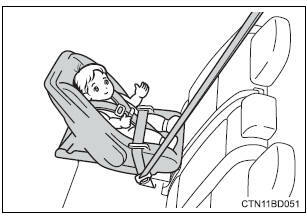 If a head restraint was removed when installing a child restraint system, always install the head restraint before driving. This will prevent it from injuring passengers in the event of a sudden stop or accident.